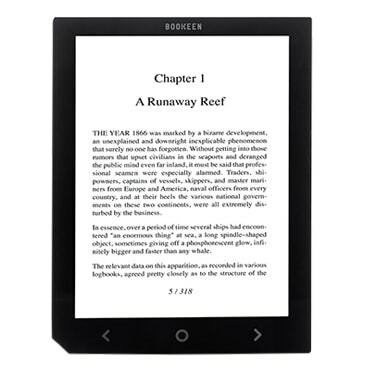 Bookeen held a press conference today to announced that they would be shipping 3 new ereaders next month. In addition to the much-delayed Ocean, Bookeen is also about to ship a couple 6" ereaders, the Cybook Muse Essential and the Cybook Muse Frontlight. The Cybook Muse sports a 6" Pearl HD E-ink screen with a touchscreen and page turn buttons. It runs Bookeen's proprietary reading software on an 800MHz Freescale CPU with 4GB internal storage, a microSD card slot, and Wifi. Fingers crossed, the Muse is due to go up for pre-order on 5 November. The retail price for the Muse Essential model will be 80 euros, and for those who want a touchscreen the Muse Frontlight will cost 100 euros. Both models are supposed to ship in mid-November. With those prices, the Muse models are clearly intended to compete with the current Kindle and Paperwhite models, and when you line them up spec for spec it is a toss up which is the better value. The Muse Essential runs on a slower CPU and costs 20 euros more than the basic Kindle, and while the Muse Frontlight can't match the Carta E-ink screen on the Paperwhite, it does cost 30 euros less. Bookeen also said today that they plan to ship the 8" Cybook Ocean next month as well. The Ocean, which is the runner-up for the title of most delayed ereader of 2013 and 2014 (it was bested by the Earl back country tablet), is going to cost 180 euros when it ships next month. This device sports an 8" epaper screen with a resolution of 1024 x 768. It's not an E-ink screen, but a "knockoff" screen from E-ink's Chinese competitor (who apparently has made peace with E-ink or can afford better lawyers than E-ink, I do not know which). The Ocean has a frontlight and touchscreen, and under the hood it packs in 4GB of storage, a microSD card slot, and a battery which the press release claims will last 9 weeks. This is going to be a rather pricy ereader, and while it doesn't have many competitors with a similar price tag the competition is very very good. The Kindle Voyage, for example, sports a uniquely high resolution screen, while the Kobo Aura H2O and the Onyx Boox T68 Lynx both use a smaller but sharper 6.8" screen. “made peace”, not “made piece”. Pls delete this after you correct. Damn. Now that is a weird typo. The Ocean is at least one year late. I don’t see a market for it when there’s PocketBook’s Ink Pad. And I don’t expect Onyx’s i86 one year late, although I haven’t heard of it in a while. Except there isn’t an Inkpad – not really.It is a couple months overdue at this point, and we don’t know for sure whether it will actually ship. I thought the Ink Pad were already shipping in Russia. People who have ordered and received it did not like it too much though, since the screens had low contrast. Forkosigan has confirmed somewhere that the device will also launch in Germany in one or two weeks. The newer batch is supposed to have better screens. But since devices from the first batch have already been shipped in Russia some time ago, PocketBook will definitely ship more. Whether the devices from the newer production batch will actually meet customer expectations, I cannot tell just yet though. Thanks! I checked Friday and there wasn’t anything.